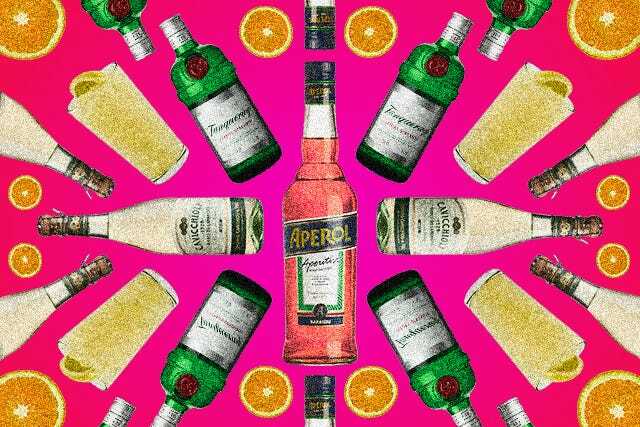 Finally, now that our winter coats are joyously settled in the back of our closets and frolicking in Central Park has commenced, we're beyond excited to start sipping on our go-to summer spirit: Aperol. Vivid, persimmon-hued Aperol, first produced in 1919 by the Barbieri brothers in Padua, is crafted from a medley of herbs and botanicals like bitter orange, gentian, cinchona, and spring-perfect rhubarb. Its simplicity only makes us want to spike it with everything. Served as a plain Jane highball with just a splash of soda, Aperol is the perfect bright, alfresco tipple — its alcohol content is also on the demure side, which means we’ll want to (and can) sip it all hot, lazy Sunday long. But, there are also plenty of ways to gussy up Aperol. 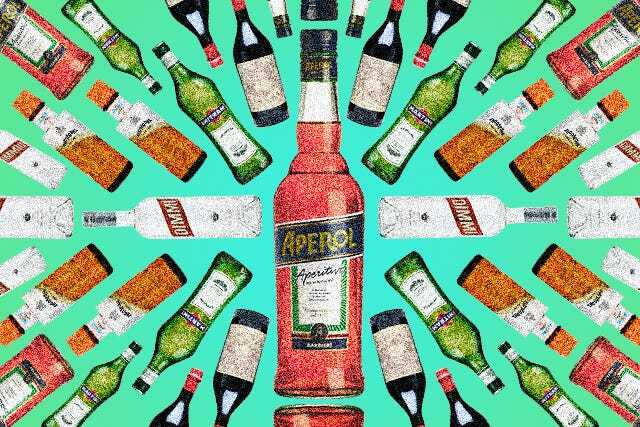 So, we asked five bar folks to share their favorite ways of savoring this lively aperitivo, from the classic, effervescent Aperol Spritz to a boozy, brunch-friendly concoction with gin. Dining at the fabled, 30-year-old Gotham Bar and Grill may not be a nightly splurge, but Jeremy Hawn’s liquid creations are a good excuse for a pre-dinner quaff at the bar. “In restaurants, cocktails are most often consumed at the beginning of the meal, when the guest first sits down,” he says. Consider the head barman’s elegant Red Right Hand, then, which marries Aperol with juicy Bonal, blanco Tequila, and orange bitters. “The flavors of Aperol and Bonal bleed quite well together, “ Hawn says, “and are further enhanced when combined with the sharp, spicy, vegetal notes of the tequila.” Ordering another round may fast become a ritual that keeps you here all evening long. Stir all ingredients with ice in a mixing glass; strain into a Nick & Nora glass. Garnish with an orange twist. Gotham Bar and Grill, 12 East 12th Street (at Fifth Avenue); 212-620-4020. Tim Cooper digs Negronis — that classic Italian cocktail composed of equal parts gin, sweet vermouth, and Campari — but "I find that drinking four in a night doesn’t sit as well with me as it used to,” admits the co-beverage director of subterranean hangout Sweetwater Social. Enter his Moonstruck, a lower-proof Aperol alternative flaunting Dimmi Liquore di Milano, Carpano Antica and dry vermouths, and orange bitters. “Aperol is perfect for this drink, as it doesn’t overwhelm with bitter notes,” says Cooper. “I group Aperol into the ‘play nice’ category — it’s easy to work with and maintains an intense layer of flavor.” Yes, this one’s named after the 1987 Cher and Nicolas Cage flick. Stir all ingredients with ice in a mixing glass; strain into a cocktail glass. Sweetwater Social, 643 Broadway (at Bleecker Street); 212-253-7467. 1. Add all ingredients, excluding Prosecco, into a mixing glass. Shake well for approximately seven to 10 seconds. 2. Add Prosecco into mixing glass, and double strain into a flute or coupe glass. 3. Finish with a long grapefruit peel that has been expressed over top of drink. The Wayfarer, 101 West 57th Street (at Sixth Avenue); 212-691-0030. While in the midst of inventory, Joe Campanale, beverage director and co-owner of dell’anima, L’Artusi, L’Anfora, and L’Apicio, couldn’t get Jamie Foxx’s “Blame It (On the Alcohol)" out of his head. 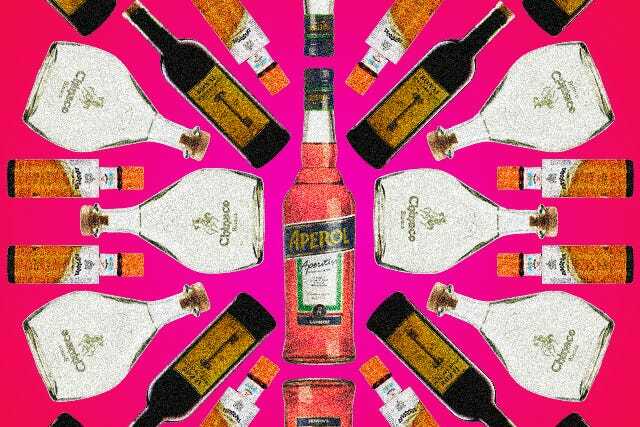 While singing the rap tune, Campanale playfully subbed the word Aperol — this is what happens when the Aperol Spritz is one of your favorite drinks — “and when I said it out loud, I knew I had to create a cocktail with that name,” he recalls. The result is this refreshing concoction, served at dell’anima, which melds Aperol with gin and lemonade and is topped with a crown of bubbly Lambrusco Bianco and a slice of orange. Fill a rocks glass with ice, and add gin, Aperol, and lemonade; stir to combine. Top with Lambrusco, and garnish with orange slice. dell’anima, 38 Eighth Avenue (at Jane Street); 212-366-6633. The grande dame of Aperol cocktails is the traditional spritz, in which the liqueur and club soda are amped by the presence of fizzy, festive Prosecco. “The idea of an aperitivo is to enjoy a relatively low-alcohol precursor to your meal, something to whet your appetite and prepare you for what’s ahead,” says Maialino’s bar manager, Erik Lombardo. “Knocking back a couple of martinis may be well and good if you only plan on having a glass of wine with dinner, but if you want to remember anything from that seven-course tasting with wine pairings, you should start slowly.” Lombardo’s on-point rendition is a pre-spaghetti alla carbonara must. Add ice and slice of orange into a stemless wine glass. Pour in the Prosecco and the Aperol, and top with soda. Maialino, 2 Lexington Avenue (at 21st Street); 212-777-2410.